Donald Trump's tweets can move markets, cutting through the world economy and registering with massive effect on the national psyche, but his predilection for junk food and heavily burnt ketchup steaks appears to be sowing cheeseburger pandemonium in Japan. 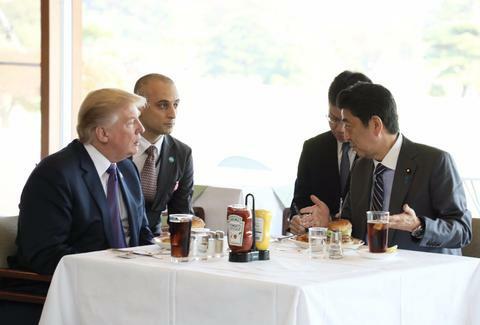 During the president's current tour of Asia, Trump chose not to indulge in some of the Japan's native and instead opted for a burger in a recent meeting with Japanese Prime Minister Shinzo Abe. Surrounded by the familiar trappings of a golf club and snapping cameras, Trump ate a $10 Colby Jack Cheese Burger from Munch’s Burger Shack, an American-style burger chain headquartered in Tokyo. But Trump's meal threw the fickle winds of the Japanese burger economy into a frenzied storm. Huge queues started forming outside of Munch's locations immediately after images of Trump's burger were seen online and the burgers quickly sold out, according to Japanese media reports. According to Grub Street, one outpost was completely sold out of all 21of its burgers the afternoon immediately following Trump's meeting. The chain took to Facebook to address the flurry of attention, saying "the president of the United States of America has given us an honor," but advised customers to expect long lines and bottlenecking when trying to grab a burger, per Facebook translate. The president is no stranger to wolfing down fast-food cheeseburgers, even while growing accustomed to some of the most lavish dwellings and opulent accoutrements available in the western world. Recently, it was reported that Trump has been ordering White House kitchen staff to recreate McDonald's food while he serves as president. For the Trump Administration, imitation Big Macs seem to be fueling the White House's deliberation of national policy and all things covfefe. While no ground beef shortages have been reported in the Oval Office, it's safe to say the president has far from an adventurous palate.